The NUXE body MELTING FIRMING CREAM With almond and orange flower petals is a double action firming and lifting body cream. Designed to streamline the body by tightening and toning the skin, reshaping the silhouette, with added anti-ageing capabilities. Added Almond and Orange flower petals keeps skin feeling soft and supple, Kigelia Africana Fruit Extract and Rye Seed Extract firm up and strengthen the skin. Jasmine supplements this double action firmness to the skin by providing protection against premature skin ageing. Active Ingredients: Glycerin, Sunflower Seed Oil, Sweet Almond Oil, Kigelia Africana Fruit Extract, Orange Flower Extract, Sweet Almond Extract. Treatment Type: Anti-Ageing Firming Body Cream. 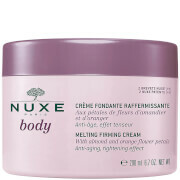 Previously called NUXE BODY FONDANT FIRMING CREAM 200ml. NUXE body MELTING FIRMING CREAM With almond and orange flower petals 200ml was found on 4 websites and was price compared using EAN: 3264680004315. The cheapest NUXE body MELTING FIRMING CREAM With almond and orange flower petals 200ml is shown as the main item, prices range from £22.40 to £35.00, excluding delivery. Price comparison based on price and delivery charges, with any valid discount codes being applied, is shown in the table above. Prices and information correct at the time of publication.